Laxmi Puja Complete Hamper containing with Ganesh Laxmi Idol (size:1.5-2 inch), Puja Samagri Kit, Puja Thali (size:8 inch) , Diya 6 pcs. 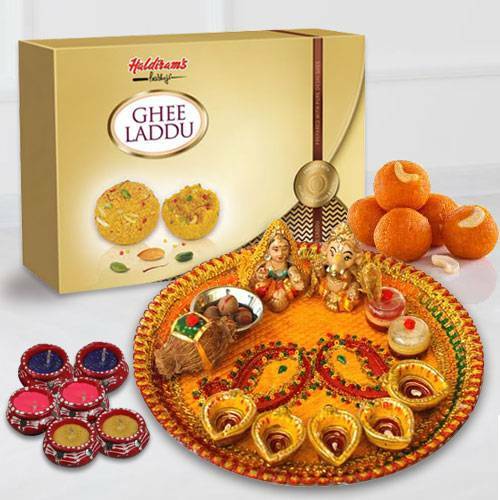 with Haldirams Pure Ghee Ladoo 500 gms. Laxmi Puja Complete Hamper containing with Ganesh Laxmi Idol (size:1.5-2 inch), Puja Samagri Kit, Puja Thali (size:8 inch) , Diya 6 pcs. with Haldirams Pure Ghee Ladoo 1 kg.